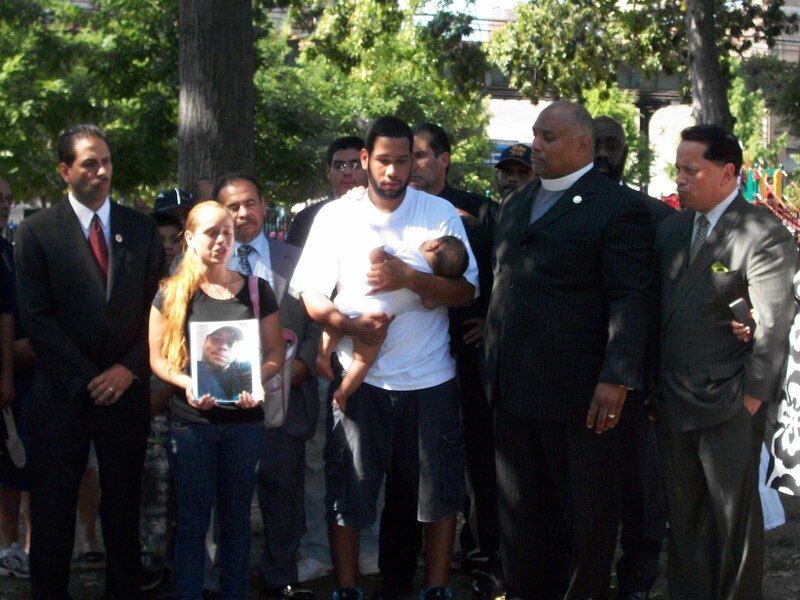 Murder victim Jelani Ciria's girlfriend, daughter and brother (center), flanked by Councilman Fernando Cabrera (far left), Bishop Fernando Rodriguez (second from right), and State Senator Pedro Espada, called for justice in St. James Park yesterday. The brutal murder of a 20-year-old Bronx man on Sunday evening in St. James Park led local political and religious leaders and members of the community -- including the victim's victim's girlfriend, 11-month-old daughter and brother -- to hold a prayer vigil in the park and call for justice as well as an end to violence that is increasing throughout the borough. Police said Jelani Ciria was shot multiple times (the family and Councilman Fernando Cabrera say it was 16 times) on Sunday at about 6:10 p.m. as he exited St. James Park. Family members say the murder was a gang related hit and added that "We know who did it." Cabrera called for witnesses to come forward in the name of justice. At the prayer vigil, Ciria's family was accompanied by other Bronx families who had recently lost loved ones to gun violence in the same neighborhood. Before the vigil began,Cabrera, along with State Senator Pedro Espada Jr., who both count St. James as part of their district, consoled the Ciria family and listened to their painful pleas for justice and action in finding the murderer. Espada offered a $5,000 reward to anyone offering information leading to the arrest of Ciria's murderer and said he would work with law enforcement to install a surveillance system in the park. St. James Park Prayer Vigil from Alex Kratz on Vimeo. Cabrera (see video above) called the recent increase in murders -- up 22% from this time last year, though shootings are slightly down, according to NYPD stats -- throughout the Bronx a case of "urban terrorism." He called for community action from citizens to report illegal guns and activity to the police and urged citizens to call police hotlines with any information that could prevent future violence. One of the vigil's chief organizers, Bishop Fernando Rodriguez, president of the Latin and African American Chaplain's Association (LACA), said his group and others were working towards planning future rallies and marches to bring attention to the increased violence. This is what's amazing to me. On the same blog that we have a fierce daily dialogue about espada, rivera, and padernacht, we have this absolutely repulsive story about a 20 year-old man being gunned down execution style in cold blood in a neighborhood park in the very same senatorial district... and while there are comments galore here on favorite candidates there is no general outcry or even one comment about this incident. Councilman Cabrera's impassioned speech is dramatic enough, but where is the outrage and disgust from our community over what has happened here... and more importantly where are the community members who saw it and, as important, where are the neighbors imploring their neighbors to come forward to identify these criminals? Allegedly Bronx people saw this crime... then Bronx people have to get together to help solve it otherwise they are condemned to live with it. So much of our leadership is worthless... just watch the debates and read the blogs and you can see what i mean... so let's take responsibility for our own communities and do what we can to get this solved, put the thugs in jail, and as a community get the god damned mother f**king guns off our Bronx streets.... with a NO TOLERANCE policy from each one of us. I understand your anger over this incident, but I never would trust any elected official (good, bad or indifferent) to take a leadership position in this situation, they are just there to issue platitudes. The real leadship has to come from the person who nobody knows, whose voice is not heard over the din of mindless chatter, who has to risk a whole lot just to see a little justice from an indifferent and ingrateful society. That person is the one who saw the incident, the neighbor, resident, family, friend, or just a passerby, who is willing to take a stand for the community. Not a mouthpiece on a soapbox looking to draw on the sympathies of the moment like a political vampire. "When will my people see peace?" You had me up to the point of the "Pitch for the gun control lobby". Whatever the motive, guns are not the issue, just the weapon of choice. This could have just as easily been a stabbing, run over by a car, a beatdown, or any other weapon of choice. Why are we not focused on why this violence persists? Why do people have such a low value for human life? Why not discuss and prove that silence will never protect you from further violence? Why our elected officials are too busy with "looking good for the crowd" rather than actually listening to their constituents? Why the area in and around St. James Park has been a haven for crime for decades and we only get around to being motivated to do anything about it when someone ends up 6 feet under? Gax, why don't you ask Monroe for a few nickles to rub together to install cameras in the neighborhood, it would be faster than waiting on these politicians. Don't wait for leadership to happen, become one! @anonymous 1:19:00 i agree and that's why i wrote what i wrote. this is not about our politicians. this is quite about how we see our own community and what we're prepared to do to preserve it. @ anonymous 1:33:00 i agree. a gang rubout has implications well beyond the singular criminal act.... and dealing with that is how we get to the root. and if you think it's unrelated to the despicable condition of the housing stock, the overcrowded inefficient disenfranchising school system, and the desperation of poverty, you'd be wrong. that's the center of it. If you don't expect your politicians to take real leadership on this issue than perhaps you should pay their office a visit and implore them to--that is their job; you pay them to take a stand on these type of things. They are there to amplify the voices of the unheard, and if you listened to the video, Cabrera is calling for the same thing you're calling for---community action. So to your point of them issuing platitudes, you were wrong on this one because there is at least one elected official that asked for the same thing you're asking for--he was just able to do it on a larger scale hence the whole amplifying principle. Please re-direct the energy of your cynicism to call on your representatives to do what he did. 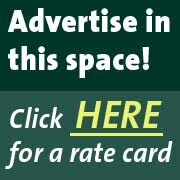 How do you know that Cabrera doesn't listen to constituents? How do you gather that from this video? Are you a constituent? Have you reached out? It just annoys me when people complain about irresponsive politicians with unsubstantiated platitudes that sound good but are not based in reality. With that said, I agree with both of you 100% on on the issue of the "unknown" citizen speaking up. That individual or individuals should speak up or help the police in their efforts. I also agree that waiting for leadership is not the option, actually leading is. I thought Councilman Cabrera was right on point in his speech in the park. He deserves credit for what he said and for the passion that appeared to be behind it. Son, this is not about one politician. I have seen decades of politicians come out to mourn for some poor soul, only for them to be stymied at any attempt to fix the system. Cabrera is a good representative, but ultimately, he has to play by the Speaker's rules just like everyone else, and I have yet to see any of those so-called leaders do anything meaningful for the people. Then you wonder why people are cycnical. And yes, I would vote for Cabrera again, but is he going to become the Speaker to get anything truly done? In the meantime, the "real" leadership still has yet to come out and tell what happened to the cops. we as a people need to step up and speak up before the crime. Everyone knows how is carrying in the hood everybody know whos house the community gun is held. So stop blaming and take a stand if you see something say something. only we can be part of the solution peace and love to the people of the bronx. Yeah. That's right. Lets judge our politicians on what they say NOT what they do. After all that is all they do. Say things. "Passionately". "To the point". What else is there.. oh yeah "right on!". You can't go to a store a buy a gun to protect yourself. But a gang member can. Think about it. Politicians did that. You can be shut on a street where you live (16 times!) and nobody would come forward to speak up..Why? Because these politicians cant even protect you from the snowstorm (as turns out). You are voting for them. In a democratic society we deserve the government we have. So all those people who represent ( or do not represent rather) us, have other priorities once elected. To get re-elected. G-d help up people to help ourselves.